Yoga become more and more popular these days. Yoga is very relaxing and has made me so flexible over the years. There are thousands of people that travel from far off countries to India to learn this ancient art form every year. Here are the listing of best yoga WordPress themes. The themes on this list are all about displaying experience and telling a story. Below themes will help you to create a professional, sleek and modern website for your business. These theme can make sure that your site will appear on their search result list. Asana is a creative and impressive yoga WordPress theme for dance studios, health clubs, gyms, event agencies, any type of sport. This theme is a very powerful SEO optimized. This theme gives supports revolution slider and nice infinite ajax scroll feature and section parallax background. This theme has free icon fonts and WooCommerce and wish and bridal lists functionality. Yogi is an elegant and innovative WordPress theme for wellness, spa and fitness and health beauty training related website. Yogi theme has the option to make the menu float in center of first slide vertically and smoothly sticky to top after your scroll. With this theme you can create as many online membership package as you wish and set the featured one using Woocommerce. Theme has 4 custom widgets to use for footer and sidebar. Theme give you support for translation using WPML or POEdit. This WordPress theme is super flexible about color and font. It is up to you to pick your favorite color scheme and text font for your website. Yoga is a attractive and visually stunning. flexible WordPress theme design. This theme is has very flexible features to customize the websites as per your needs using live theme customize. This WordPress theme is fully hand coded and its HTML is written keeping in mind your sites good ranking on search engines. This is also help search engine to analyse your site easily. Theme gives you fullscreen slider which allows you to show nice yoga class. Yoga Fit is a gorgeous and marvelously professionally designed WordPress theme. This theme has a supper responsive layout that will respond to your screen width and make content appearance be perfect on all devices from large desktop screens to mobile phones and tablets. This theme give you a large collection of custom widgets and provide advanced options for social networks like Flickr, Facebook and Twitter. This theme gives you 99+ custom shortcodes work as fantastic building blocks for your pages. Somnus is a incredibly smooth and attractive yoga WordPress theme for pilates and fitness studio businesses and yoga. This theme has powerful visual composer included and lightning fast and fully localized and translation ready. This theme has responsive and device-tested and easy to understand documentation. This theme gives you super smooth parallax and super fast performance. Spalon is a powerfully developed and visually stunning yoga WordPress theme. This theme includes all the necessary pieces to put together your perfect spa or salon site. This theme includes all the necessary pieces to put together your perfect spa or salon site. This theme comes with 9 custom widgets and powerful theme options panel. Theme comes with powerful shortcode generator and give you full localisation support. Theme has 18 beautifully designed page templates. This theme comes with social media ready and logo and favicon uploaded and page header image uploaded. Yolia is a stylish and modern WordPress theme besides it suits for any type of design yoga, spa, beauty, business etc This theme comes with advanced option panel and font awesome icon integration and drag & drop page builder. This theme has demo data .xml included and HTML5 & CSS3 and clean code & less CSS optimized. This theme has WPML compatible and premium plugins included. 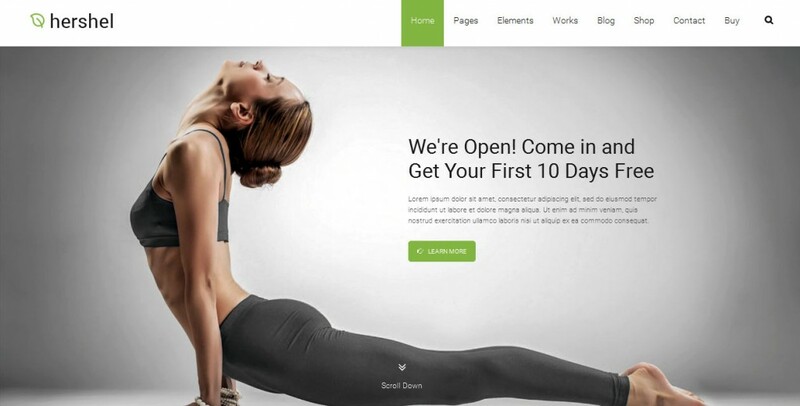 Yogastudio is a beaitufl and powerful WP theme. The theme is fully responsive and 100% Retina ready. Theme gives you custom Theme options panel and media content manager and optimized for best performance. Hershel is an elegant and impressive WordPress theme. This theme is high speed & extra optimized and SEO friendly. This theme gives you easy color management and Google font support 600+ and different header types. This theme has visual composer for WordPress and ultimate addons for visual composer and revolution slider. This theme has sticky menu and unique home pages. It has creative about pages and unique custom pages and different portfolio pages and standard and wall galleries. Bleute is a modern and beautiful fully responsive WP theme. This theme has unlimited color, you can choose the best suitable color to make your brand best. This theme has contact form 7, contact form 7 allows you to create the different contact form in the different pages for many purposes easily and quickly. Maniva Gym is a well-designed WP theme. With inbuilt drag and drop page builder you can make the website creation a whole lot easier. Skin Beauty is a professionally designed WordPress theme. You can have parallax background in your desired section. You can also set parallax speed or have it fixed as well. 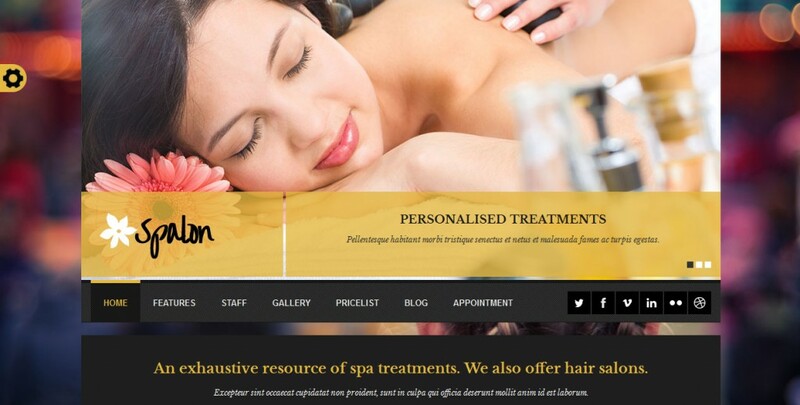 Spa Lab is a attractive and impressive WordPress theme. The site owner may alter the logo, color, social links, service or product prices, and contact information. Interesting blog post can be written, in order to explain your offers in detail. The process is user friendly, given the inclusion of Drag and Drop capabilities.